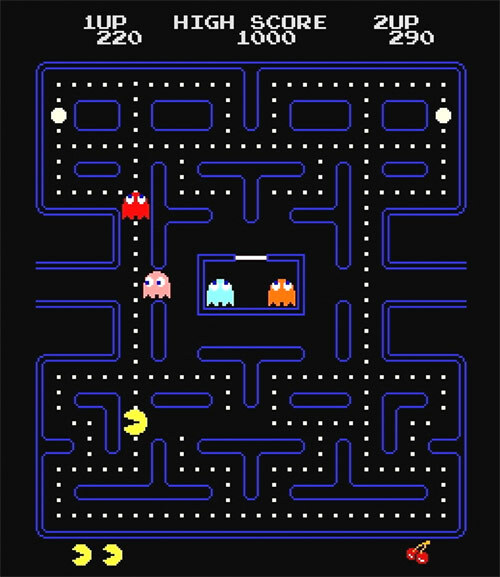 Oh, remember when Pac-Man was as big for the 1980s as "Star Wars" for the 1970s? He didn't have the staying power of Luke and Leia, but the little yellow guy sure had some marketing chops. Let's take a look, shall we? Pac-Man Cereal! Man, this is one catchy jingle, plus like the Brady Bunch as the Silver Platters, they have choreography! Ms. Pac-Man cereal! Christian Bale is one of the kids in this commercial. Do you think after the camera shut off he swore at the lighting guy? Pac-Man Pasta. Pac-Man himself sounds like a dolt here, but he has his whole family along for the ride, and they swallow some ghosts whole. Meatballs, no meatballs, or chicken flavor? Pac-Man: The Cartoon. Hey, how about if we just animate the game and give it some dumb voices? 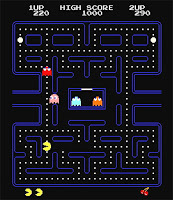 Pac-Man for the Atari 2600. Oh, how I loved this game. Played it for HOURS. Was it really this bad? In this ad, "Sesame Street's" Mr. Hooper plays it. Love how they have to explain that the game does not come with the console. Weird Al's "Pac-Man" parody, set to the Beatles "Tax Man." Fan-made video, but the song is still fun. Eventually, they came out with Pac-Man Underoos, but note that the kids are too embarrassed to wear them -- they want to be superheroes instead, so they kind of just shove the Pac-Man Underoos in there at the end, still in the package. I've also explored these Pac-Man trends at my own blog; you can almost explore the entirety of 80s pop culture through that one game alone.